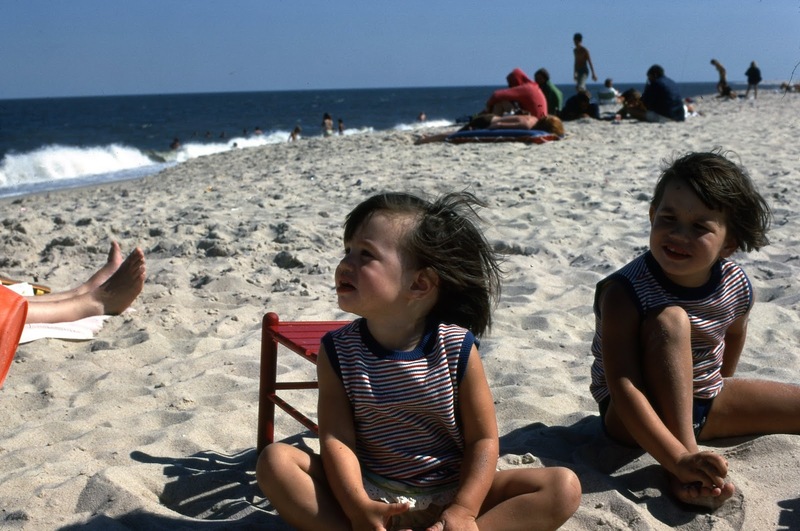 Daughters 1 & 2, Melissa and Christine sitting on the ocean beach in Miami Beach years and years and years ago. Mary's post yesterday really brought back memories for me. So, I decided to continue the Florida theme today. My husband and I started vacationing in Miami Beach, Florida years and years ago----long before it was "SoBe" and tres fashionable. We simply loved the summertime South Florida weather and beaches. Believe it or not, we first went during the late summer following the birth of our first child, daughter Christine. She was several months old. I'm convinced we had the only baby on that famous stretch of Miami Beach which is filled with what are now called Art Deco hotels. stretch out and relax----or walk out and enjoy that wonderfully warm South Florida stretch of ocean. Now---there's a roof-top bar & lounge, 24-hour fitness center and Yoga classes. :) The Betsy Ross wasn't "famous" then, simply a gracious old hotel with a great location. Believe it or not, this is a photo from one of our early visits to the Betsy Ross. Notice the old stone sea wall that used to be there all those years ago. Fierce Atlantic hurricanes battered south Florida for several years in the 1970s and the beaches took a beating. My husband and I (with four daughters by then) switched to the Gulf side of Florida with its calmer Gulf of Mexico waters and beautiful beaches. He and I returned to Miami Beach in the mid-1990s when that entire South Beach area became "SoBe." That made us laugh. 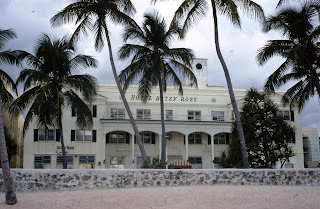 The wonderful old Betsy Ross hotel was totally booked, so we stayed farther down that famous stretch of Ocean Drive at another Art Deco-era hotel looking out on the ocean. We walked down to the News Cafe every morning for a newspaper and feasted every day on fantastic fresh seafood. As it happened, that was the very time when the famous designer Versace was murdered right on the doorstep of his famous Ocean Drive home. My husband and I were relaxing out in the wonderful warm ocean waters, floating along, when all these helicopters appeared overhead, flying up and down the oceanfront. That evening, everyone learned what had happened. I'll end these memories on a much lighter note and recommend a movie from 1996, which is easy to see with all the movie options available now. The famous director Mike Nichols made a laugh-out-loud movie called BIRDCAGE with actors Robin Williams, Nathan Lane, Hank Azaria and a wonderful comic cast. It's a remake of the then-hit LA CAGE AUX FOLLES. If you like to laugh, you'll enjoy it. Plus, it presents a wonderful picture of "South Beach" back in the crazy mid-1990s.